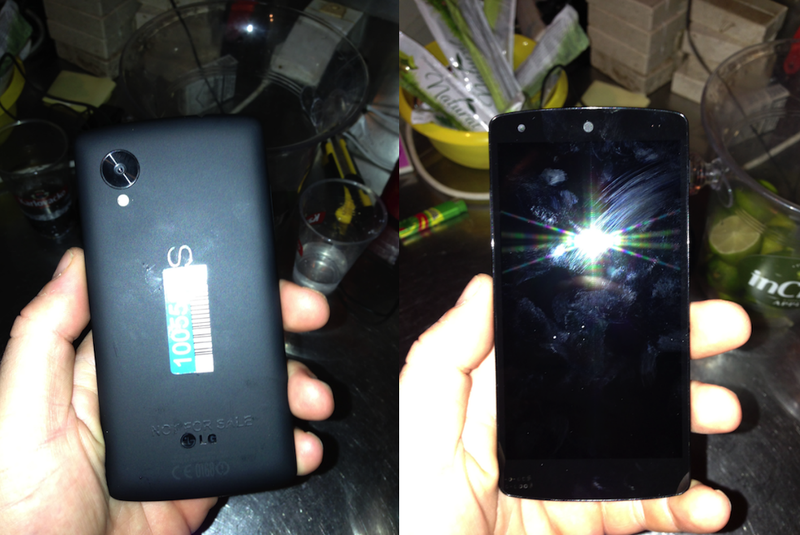 Hello there LG Nexus 5 and welcome to the land of “in the wild shots” of pre-production units. This device, apparently left sitting on a table by a Google employee at a bar was picked up by another individual who snapped the three images and captured two videos. Thankfully, it looks exactly like the images we just saw pass through the FCC and the “accidental” Google KitKat video. The videos and images show the devices startup and lock screens, as well a not-so-hidden Nexus logo. After several attempts at unlocking the device, the bar patron reboots the device and takes a pic of the boot animation. There’s not a lot else we can gleam from these images, but they are certainly enough to whet our appetite and if the current pattern of news is any indication, we’ll know everything about the Nexus 5 through leaks and official FCC documents courtesy of the Federal Government by the time Google actually announces the device next month. Ugh… deciding between this or the LG G2. I’m in the exact same boat. I’m either going to sell my Note 2 for the LG G2, or the Nexus 5. I’m hoping the Nexus 5 has a 5″ 1080p screen (would make sense right) + Snapdragon 800. If it has those two things then I’m sold. If not, the G2 may be calling my name. I like a lot of the features LG has included. First, it’s technically not 1080p, but a little under, with a ratio closer to the N4’s 5:3, this being, whole numbers, 299:180. Why would you sell the Note 2 for that phone? Yeah I would not sell my note 2 for that phone. The only real world difference is that nice screen it has but for me I’m sticking with the note 2 at least until I get what I want out of the Nexus 5. Everything goes if I get what I want. im going with the LG G2… I need wifi calling. Right. I’m kinda leaning towards the G2 myself. I love the sleek look of it (not thin/slim, but it looks simple and sleek). Plus I heard the battery life is outstanding (One of the #1 features I’m looking for). I usually would be all for WiFi calling, but the apartment I’m staying on by my school’s campus is so cluttered with Students on it, it would be a total fail trying to use WiFi. Plus we’re not allowed to use Routers, etc. because something about it’ll interfere with something or some kinda bullcrap. There is a rumor that the Nexus will have a smaller battery then the G2. Google it. Okay, thanks. But did you thumbs me down for that? it’s not a rumor, it’s confirmed. it will have a 2300 mah li-po battery. No SD card…that is a deal breaker for me. The screen is nice though. It’s a pity he didn’t take a closer look at all the fine print on the casing. 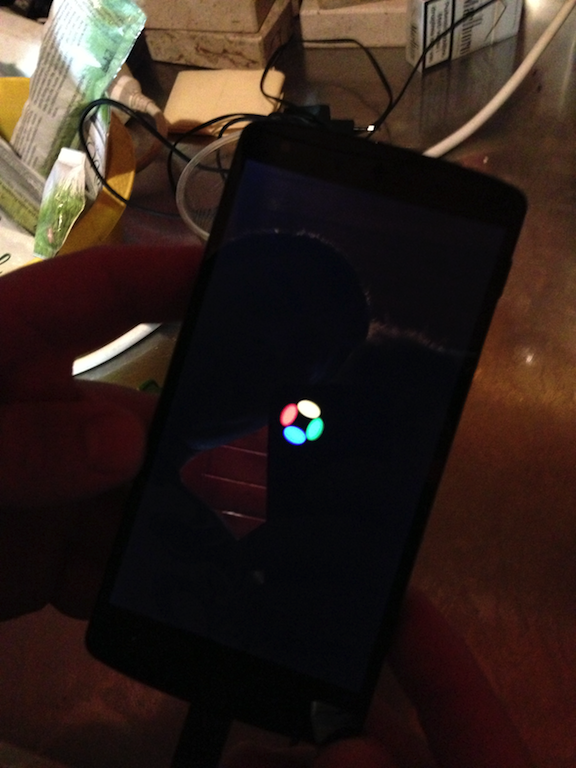 I’m really sure the Google employee just left their Nexus 5 hanging around the bar…wink wink. This is almost as obvious a marketing ploy as when Eric Schmidt was “caught” talking on a Moto X before it was announced. I agree 100%, I am starting to think they are doing this to wet everyone’s whistle, that, or every employee who is given a phone before it’s released is a drinker who isn’t responsible. If that’s the case, hire me! I am responsible and don’t drink! We see the writing on the wall with this and the empty stock of 16 GB Nexus 4 on the Play Store. Looks like a dime-bag in the 2nd photo. The rear is a little bit of a letdown. The Nexus 4 being glass on the back was a little more premium looking for a halo device when compared to this. Hopefully this is just a mock-up rear (doubt it) and not just a downsized looking Nexus 7 device. Too bad it was made out of poverty glass and broke when you look at it and felt really uncomfortable. I never understand why people are so obsessed with the back or thickness of the phone then they go cover it with an ugly looking plastic case from China. dont understand why you would want something that shatters easily like glass. Just do a search on xda n4 and there is a whole thread on people’s rear glass randomly cracking or completely shattering easily. Looks like shrinked version of new Nexus 7. All I’m asking for is a SD card slot and a removable battery added Google. I won’t need another phone for the next 10 years. Yea I said it!!! I just really didn’t like the N4 especially compared the the HTC One! I love the One S and was hoping the N4 would blow it away but it didn’t. I guess I really like HTC Sense. I also think that HTC has the best camera out there and that’s what really got me. I’m an IT tech so I use and rely on my phone a lot. I don’t know if I want to try the N5 when i’m so happy with the One but I would like to see what the difference is this time around. Any ideas or suggestions?